All nominated book titles are at our library. 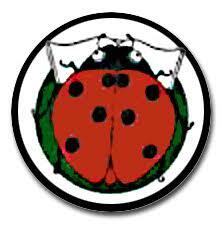 What is the Ladybug Picture Book Award? Sponsored by the Center for the Book at the NH State Library, this award is given to a picture book that is voted the best of ten titles by children pre-K through 3rd grade.The Ladybug Picture Book Award is designed to promote early literacy and honor the best in recent children's picture books. A committee of children's librarians from around the state selects 10 picture book titles each spring. Then, during November, New Hampshire children from preschoolers to those in third grade choose the award winner. The winning picture book is announced at the end of the year. - Center for the Book at the New Hampshire State Library. Amazon Summary: "If you ask her, Alma Sofia Esperanza José Pura Candela has way too many names: six! How did such a small person wind up with such a large name? Alma turns to Daddy for an answer and learns of Sofia, the grandmother who loved books and flowers; Esperanza, the great-grandmother who longed to travel; José, the grandfather who was an artist; and other namesakes, too. As she hears the story of her name, Alma starts to think it might be a perfect fit after all — and realizes that she will one day have her own story to tell. In her author-illustrator debut, Juana Martinez-Neal opens a treasure box of discovery for children who may be curious about their own origin stories or names." Amazon Summary: "This picture book shares the tale of Arfy, a homeless mutt who lives in a box in an alley. Arfy writes to every person on Butternut Street about what a great pet he'd make. His letters to prospective owners share that he's house broken! He has his own squeaky bone! He can learn to live with cats! But, no one wants him. Won't anyone open their heart--and home--to a lonesome dog? Readers will be happily surprised to learn just who steps up to adopt Arfy. Troy Cummings's hilarious and touching story is a perfect gift for a child wanting a dog, and for pet adoption advocates. It also showcases many different styles of letter writing, making it appealing to parents and teachers looking to teach the lost art of written communication." Amazon Summary: "​The Lago family really loves their couch. It’s perfect for reading, snuggling, playing, and jumping. But all good things must come to an end, and, one day, the family realizes the time has come to replace it. As they drive home with their brand-new bright-red couch, though, it gets knocked off the top of their car into a field . . . where a llama tries to make sense of this new thing. At first confused—It doesn’t talk! It doesn’t taste good! It doesn’t budge!—the llama soon realizes how comfy the couch is and settles right in. Can the family get its furniture back—and keep llama happy, too? Leah Gilbert has written and illustrated a warm picture book that touches both the heart and the funny bone." Amazon Summary: "There are many reasons to feel different. Maybe it's how you look or talk, or where you're from; maybe it's what you eat, or something just as random. It's not easy to take those first steps into a place where nobody really knows you yet, but somehow you do it. Jacqueline Woodson's lyrical text and Rafael López's dazzling art reminds us that we all feel like outsiders sometimes-and how brave it is that we go forth anyway. And that sometimes, when we reach out and begin to share our stories, others will be happy to meet us halfway." Amazon Summary: "Inky had been at the New Zealand aquarium since 2014 after being taken in by a fisherman who found him at sea. Inky had been getting used to his new environment, but the staff quickly figured out that he had to be kept amused or he would get bored. Then one night in 2016 Inky, about the size of a basketball, decided he’d had enough. He slithered eight feet across the floor and down a drainpipe more than 160 feet long to his home in the sea. Acclaimed author Sy Montogmery reminds readers that Inky didn’t escape—but instead, like the curious animal he is, wanted to explore the rest of the vast ocean he called his home." Amazon Summary: "​While riding the subway home from the pool with his abuela one day, Julián notices three women spectacularly dressed up. Their hair billows in brilliant hues, their dresses end in fishtails, and their joy fills the train car. When Julián gets home, daydreaming of the magic he’s seen, all he can think about is dressing up just like the ladies in his own fabulous mermaid costume: a butter-yellow curtain for his tail, the fronds of a potted fern for his headdress. But what will Abuela think about the mess he makes — and even more importantly, what will she think about how Julián sees himself? Mesmerizing and full of heart, Jessica Love’s author-illustrator debut is a jubilant picture of self-love and a radiant celebration of individuality." Amazon Summary: "​Rashin is excited about her first visit to the beach in her family's new home. On the way there, she remembers what beach trips were like in Iran, the beautiful Caspian Sea, the Persian music, and most of all, the saffron ice cream she shared with her best friend, Azadeh. But there are wonderful things in this new place as well -- a subway train, exciting music... and maybe even a new friend!" Amazon Summary: "Everyone in the neighborhood dreams of a taste of Omu's delicious stew! One by one, they follow their noses toward the scrumptious scent. And one by one, Omu offers a portion of her meal. Soon the pot is empty. Has she been so generous that she has nothing left for herself? Debut author-illustrator Oge Mora brings to life a heartwarming story of sharing and community in colorful cut-paper designs as luscious as Omu's stew, with an extra serving of love. An author's note explains that "Omu" (pronounced AH-moo) means "queen" in the Igbo language of her parents, but growing up, she used it to mean "Grandma." This book was inspired by the strong female role models in Oge Mora's life." Amazon Summary: "​There's a wall in the middle of the book, and our hero--a young knight--is sure that the wall protects his side of the book from the dangers of the other side--like an angry tiger and giant rhino, and worst of all, an ogre who would gobble him up in a second! But our knight doesn't seem to notice the crocodile and growing sea of water that are emerging on his side. When he's almost over his head and calling for help, who will come to his rescue? An individual who isn't as dangerous as the knight thought--from a side of the book that might just have some positive things to offer after all!" Amazon Summary: "It's the first day of school for Penelope Rex, and she can't wait to meet her classmates. But it's hard to make human friends when they're so darn delicious! That is, until Penelope gets a taste of her own medicine and finds she may not be at the top of the food chain after all. . . ."